"Where is the nearest toilet?". This is the answer. - Tightly sealed, super adsorbent material (SAP) hygienic, rapid solidify, no peculiar smell, odorless, nontoxic, Safety and Healt. - Material: Container: cotton core + non-woven fabrics + PE waterproof membrane design, Cotton core inside contains Absorbent polymer, Outside is blue PE bag. - Urine or liquid waste combines with a polymer in the pouch to form a spillproof, odor-free gel. Then dispose at your convenience. - The bag opening is made of soft materials, so you must hold the bag while using. - The use of this product by children should be under the supervision of adults. - Please do not throw into the toilet to avoid clogging. Add to Cart now and don't worry when the toilet is out of reach. 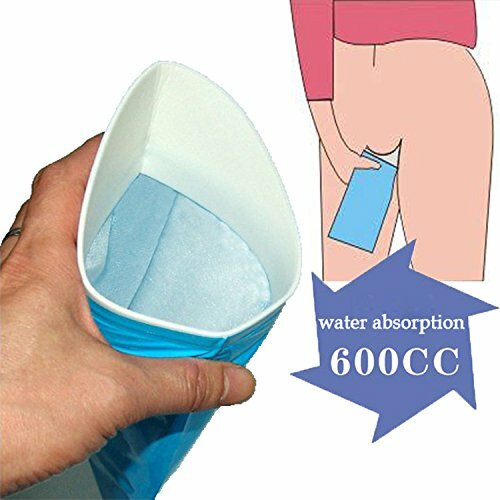 GREAT ABSORBENCY: The bag contains absorbent polymer, which could absorb urine, vomit or any other liquid and turns it into spillproof, odor-free gel, without leakage after an absorbent. HIGH CAPACITY: The Portable Camping Toilet can absorb water up to 600 cc. SUITABLE FOR EVERYONE: Unisex adapter make it easy for anyone to use. Portable Camping Toilet also allows women to urinate while standing up that is very convenient. If you have any questions about this product by Gencorp JSC, contact us by completing and submitting the form below. If you are looking for a specif part number, please include it with your message.